If you&apos;re jonesing for any kind of cinematic calories this Friday, Thor: The Dark World will tickle your taste buds just fine so long as you don&apos;t expect it to be fine cuisine. It&apos;s an action movie that knows its purpose — it&apos;s got dazzling set pieces, a predictable plot, fun characters, and dialogue that is occasionally witty and always accessible. It knows that a film can&apos;t survive only on special effects, so it provides a solid story foundation for all its flair without ever indulging in the writing department — a common mistake with blockbusters these days. In these ways, it&apos;s the spitting image of its predecessor, Thor. The difference this time around, though, is that without a silver-screen legend like Kenneth Brannagh (the director of the first Thor) at the helm, we were never under the illusion that it was going to be anything other than simple repetition of the last film&apos;s formula, so the fact that Thor: The Dark World is only adequate isn&apos;t a disappointment. For that alone, I&apos;d say The Dark World is the better of the two. Yet, in keeping with the formula of the first, it delivers a crazy plot. Back at the dawn of time, these creatures called the Dark Elves wandered the earth. When the modern world came to be and the nine realms that compose the multiverse split apart, they disappeared, not to return until the multiverse was reconstituted. This happens and they attempt to return the world to its original state through the destructive use of something called Aether. Their efforts are thwarted, though, by the gods of Asgard, who step up to the plate whenever such convergence happens. Wouldn&apos;t you know it, the movie starts just before another convergence. 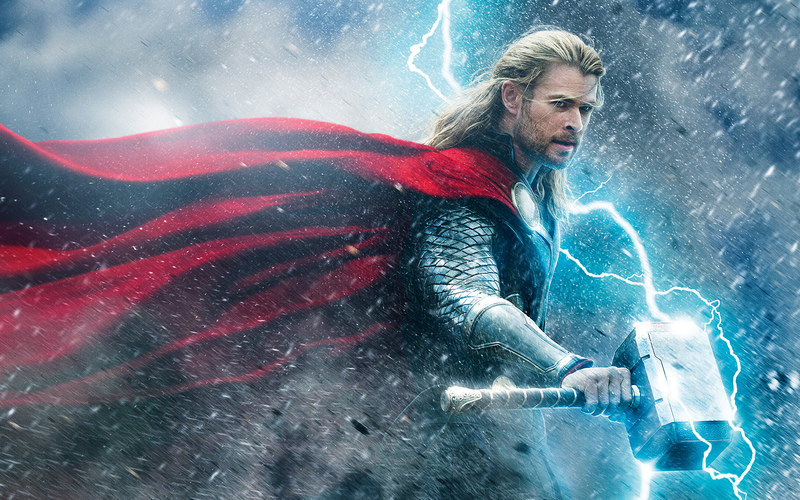 Now, it&apos;s up to Thor (Chris Hemsworth), the Asgardian god of thunder, to protect us from those Dark Elves. To do so, he enlists the help of his girlfriend Jane (Natalie Portman), his evil half-brother Loki (Tom Hiddleston), his dad Odin (Anthony Hopkins), crazy physicist Erik Selvig (Stellan Skarsgard), and an entourage of his warrior colleagues. It&apos;s all par for the course, and, for most of the time, the film runs smoothly as we&apos;re carried from scene to scene without interruption. The only snag is an unnecessary prologue whose only purpose is to present us with information that is clearly and repeatedly laid out for us later, but even that has big god battles in it, so it&apos;s not a major bother. Theoretically, it also presents us with the extent of the Dark Elves&apos; power early on. Sometimes the film does indulge in this kind of exposition, though. For instance, it&apos;s really weird how they repeat a scene of Stellan Skarsgard naked at Stonehenge twice for no good reason. Another problem with the movie — and this may be more a personal gripe — is that the creators play too fast and loose with the internal logic. I mean, I know it&apos;s all supposed to be magic (or "quantum physics," which, in Hollywood, amounts to the same thing), but when we don&apos;t really know the rules of the game, we get a bit taken away from the experience. Even the illusion of a logical world helps keep the plot engaging. We don&apos;t know what these gods can really do, or what their technology is capable of, or how the "convergence" affects the laws of physics — we only know that it does. This aside, though, the movie does take proper care of its character development, dialogue, and story, and it certainly delivers on the visual front. While we might miss Thor as a boorish viking who cares not for matters that don&apos;t involve skirmishes and booze — he goes through a transformation into a more responsible sort of god during the first movie — we have similar fun with Loki&apos;s character arc this go round as we delve into the motivations of this megalomaniac villain and come to sympathize with him and his schemes (even though he killed a bunch of people in The Avengers). Thor is a smart movie because it knows its limitations. It has just enough on its plate to keep us interested and entertained all the way through, and that&apos;s all you could ask for in a superhero movie, really.